Jeanne Damas is the ultimate French girl that has the same style vibes as Jane Birkin. The strength of her way of dressing is all in its simplicity. Het outfits come from a very clear sense of style, of knowing what fits her what doesn’t. Her new IT bag of choice reminds strongly of the basket bag Jane Birkin was inseparable from. 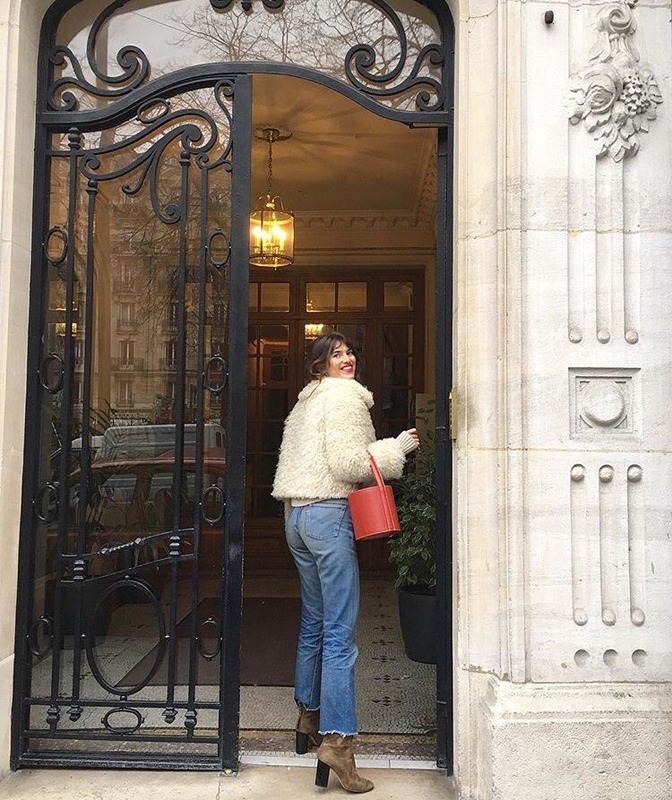 The bucket bags Jeanne Damas updates all her outfits with does for her outfits what the basket bag did for Jane Birkin’s. As much as I love basket bags, they are not the most practical for every occasion. Luckily we now have bucket bags to fill that gap. Because funny enough, comfort shows on your outfit in a good way. Having the right balance between comfort and what looks good is a must to attain the best looks. The bucket bag is the French girls’ answer to comfort and practicality. Done with an impeccable sense of style, bien sûr. They have something cute and playful that matches great with serious leather in every size. A bag for real life with the charm of a beach bag. That is how you invite some breeziness into everyday tasks. Versatile enough to take you from a busy day at work to a night out. Jeanne Damas her favorite item comes in all shapes and sizes. From serious, big and minimalistic, to woven and playful. My favorite is a vintage looking bucket bag, complete with a gold locket and leather handle. The bucket bag charm works its magic every time! Wear them fabulously on your wrist, casually in your hand or practically on your shoulder. The rest of your outfit is all taken care of because the charm of the bucket bag does the rest! Jeanne Damas effortlessly perfect outfits are all the proof I need.